But last week Koji ma posted this endless 50 inch strand of "pondslime doublet keishis", and I thought, oooh. These are not the pearls your parents gave you for your graduation. Keishis (also spelled keshi) are, as a Tiffany saleswoman once told me, "an extra gift from the oyster", formed while it ejects an implanted nucleus (which is how cultured pearls are made). Keishis can form in either fresh or saltwater pearls, so an accurate description indicates the pearl type as well, such as "Chinese freshwater keishi". Because keishis don't have that nucleus to guide the shape, they are 100% nacre, and never spherical. That solid nacre lends lustre and shimmering surface (orient) that beats even the finest cultured nucleated pearls. Occasionally they form in spikes, like these "spikey pondslime keshis", which I call "punk pearls", $65 for a 16 inch temporary strand. "Pondslime" refers to the rich natural colours (taupe, rose, lavender, green-gold) that occur in some freshwater pearls. Once obliterated with dark dye by Chinese pearl processors, they are now desirable. Keishis also come in white, if that's your preference. Here's a full, lustrous 17.5 inch necklace, each pearl is about 15mm-16mm long; $210. All pearls ar e lovable; a classic strand of Akoyas or Chinese freshwaters is a timeless, versatile adornment, often the first pearls received. Shown, Tiffany 18 inch 7-7.5mm white pearl necklace, white gold clasp, $5,000. And those sumptuous, huge South Sea and Tahitians? Breathtaking as a Dior ballgown (and about as likely to grace my wardrobe). But my passion these days is bumply baroques, funky keishis, off-rounds, coins or sticks that flash rainbow iridescence. So here come my new pearls, which cost $170. May I tantalize you with a few more remarkable pearls from Kojima? The strand I bought is now sold out, but there are many more marvelous choices. Or if you have a pearl dream, contact Sarah Canizzaro, Kojima's friendly owner, and she'll help you. She's passionate about pearls too! Gold, peach and pink South Sea and petal pearl 17 inch necklace, $713. A not-too-pricey route to some South Sea beauties on your neck. Exceptionally lustrous round to semi-round Kamoka (Tahitian) black pearl 16.5 inch temporary strand, 9.2 to 9.5mm, $2,390. Dreamy. 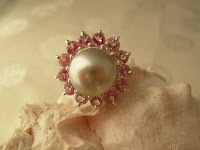 10.3mm Tahitian pearl and pink tourmaline ring, set in silver, size 6, $150. Simply stunning! If I ever get around to purchasing a real pearl necklace, I'm going to have a tough time narrowing down my choices, thanks to all the lovelies you've shown here and in previous posts. Oh those are all lovely! I keep looking at Kojima pearl but haven't yet found the perfect combination of desirability, affordability and availability. I will. I believe that first strand strand in your post was in the museum of natural history for many years. I remember staring at those pearls, stunned by their beauty. I had never seen anything like them and they completely changed the way I looked at pearls, and jewelry. Pesu: A real pearl necklace can be had for LESS than the the price of many costume pieces! Kojima have a very good return policy so you can receive pieces and then select the best one. Sarah Carnizzo says, "This is a very special strand of natural color baroque Japan Kasumi pearls. I made this strand in 2000, and was overjoyed to be able to visit it in the Museum of Natural History in New York City in November of 2001. The Pearls exhibit then toured the world, visiting many of the world’s most treasured museums. Thrilling and educating thousands of visitors, this strand was featured because of it’s unique origin. The strand has spent the last 8 years under the most careful care, and we were happy to see that the pearls had retained their deep colors and luster." Lovely!! Now that I know about them I will look for them. The bargain priced ones are just lovely. There is a travelling jewelry exhibit show that comes round here every few months - I will look for keishis next time they come. I have a hankering for earrings that look like that ring you show last. Thanks for the continuing education in pearls. g: There are differences in quality, not all will be like this! The ones I've shown are undyed. LPC: Pearls are my passion and I hope to intro readers to innovative designers and reputable sources of both classic and unusual pearls. As you know, I too like pearls and have already told you about mine. I´ll try to send a picture of them one of these days in my blog. I like big ones, and naturally the top ones are my favorites. But which ones are the ones you bought? Did I miss something? Thanks to you, I've been wearing my pearls a bit lately and enjoying them. I have a strand of creamy-white baroque pearls punctuated with Lapis Lazuli beads -- I'd been finding the length awkward but have figured out a few different ways to work it, including using the strand to hold a pendant. So thanks for getting my pearls out of their cases and onto my neck and also thanks for the inspiring possibilities you tempt us with. metscan: I bought the second pearls pictured in the post, the pondslime doublet keshis. I have a number of strands of large, more classic pearls, am now on to unusual varieties. materfamilias: Why not restring to a more pleasing length? Pearls and lapis is a beautiful combination. Duchesse - you are so incredibly generous to share all your knowledge and sources with us. Simply beautiful and unusual. Thank you.